In Africa an elephant dies from a poacher’s bullet every 15 minutes. But in South Africa’s private reserves they’re breeding like bunnies and there’s trouble up ahead. The scramble to head off the death sentence of a persistent elephant called Riff Raff is a synecdoche – because, by some, he is unwanted. It began with an unsanctioned two-strand electric fence. The wires were strung across the centre of the Greater Makalali Pidwa Private Nature Reserve in Limpopo to keep out elephants the owner of the northern sector said were were no longer welcome. In March, Makalali tried to relocate the main “troublemaker”, 45-year-old Riff Raff, to the Olifants River Game Reserve in Balule where he would have large wilderness areas to roam. He was having none of it. Within 48 hours he was back at Makalali with a trail of broken fences behind him. This might be his death warrant. The back story has to do with a growing elephant issue in South Africa. The country has around 24,000 elephants within private game reserves and national parks. When bull elephants leave their natal herds in search of a new home range, they they often encounter the fences that criss-cross their paths and destroy them. Repeat fence-breakers are often considered to be “problem or damage-causing animals” (DCA) and are shot. Many are simply bulls doing what they’re biologically hard-wired to do. In order to move up in the bull hierarchy and sire offspring, they must leave their family and find a new range and unrelated females. Part of the problem is that many private reserves fail to limit elephant numbers and an elephant community can double in size within 10 to 15 years. Traditionally, lethal population control methods such as culling were considered to be the answer, but this proved counterproductive. Those that remain simply speed-breed to fill the gaps. Immuno-contraception or opening escape corridors are proven alternatives and there are also excellent, scientifically calibrated norms and standards on elephant management. Makalali uses contraception, but some reserves ignore these and end up with an elephant crisis. Pidwa responded by placed spring guns along the wire that fired blanks, and a helicopter was used to chase the elephants back. But each time the dam drew them back. McCormick threatened to shoot Riff Raff. Makalali applied to LEDET for a destruction permit. Riff Raff, a much-loved elephant who had been monitored for 18 years and who plays an important genetic role in his community, was labelled a “problem or damage-causing animal” and faced the death penalty. The EMS Foundation and Ban Animal Trading instructed a lawyer to write to LEDET requesting that it investigate and assess the situation and prevent the elephant from being harmed. LEDET’s response was to note Makalali’s request to hold off on the destruction permit. But it also pointed to legislation stating that, if the owner fails to solve the problem, it may be shot. After their previous efforts to mitigate the situation failed, HSI-Africa appealed to the reserve to relocate Riff Raff. 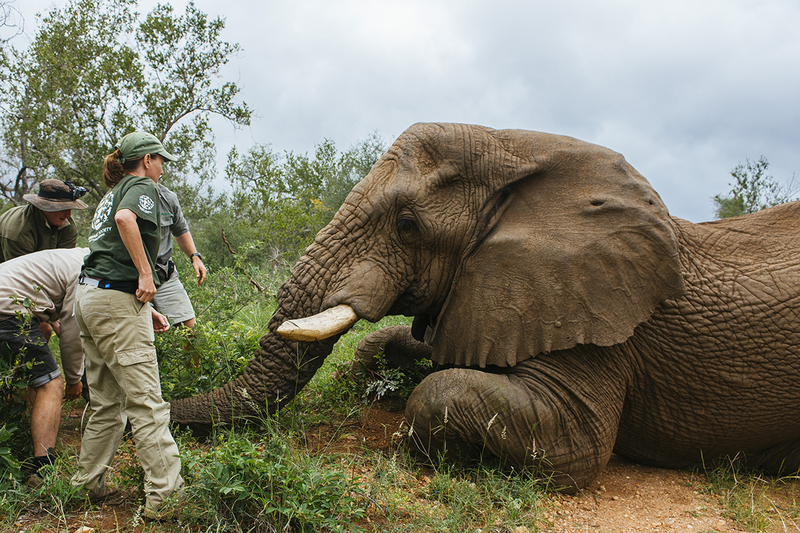 With support from Elephants Alive, Wildlife Vets, Global Supplies and an anonymous donor, it was agreed to relocate him to the greater Balule Game Reserve. This required helicopters, tranquilisers, antidotes, cranes, elephant-sized crates and trucks capable of carrying the 6,400kg animal. It’s not cheap to move an elephant. This is where the process got complicated. Coinciding with Riff Raff’s removal, the reserve opted to relocate two breeding herds to Lapalala Game Reserve. But, during the attempted capture of the first herd, a female elephant died and a second had to be woken up for her own safety. Gary Elmes, chairman of Makalali, said she went down after being darted in an extremely thickly vegetated area and could not be recovered. 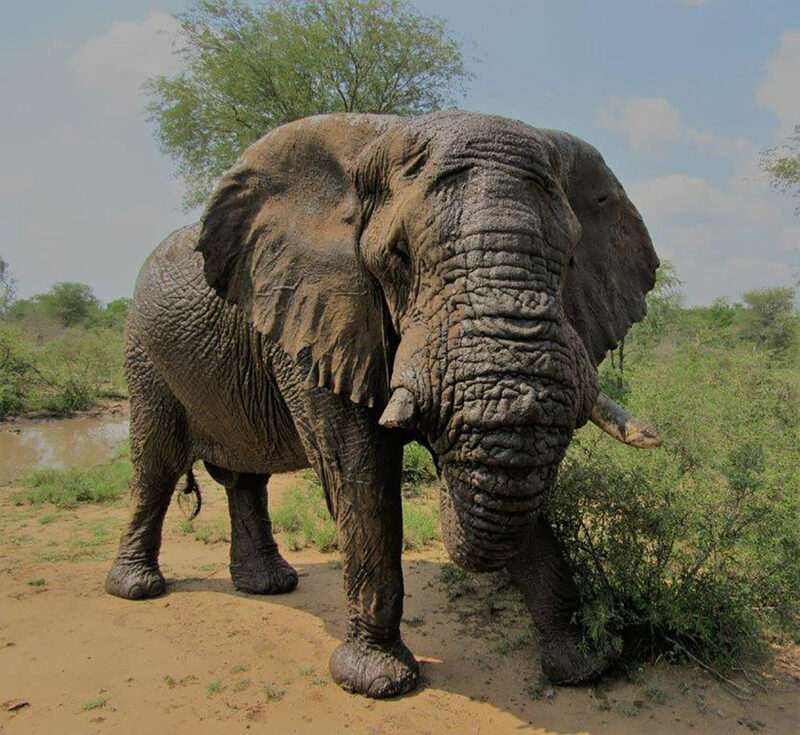 With a herd member dead, Makalali abandoned the relocation and woke up the other immobilised elephants from that herd. The other herd, however, was located, darted and successfully translocated. Riff Raff’s drama symbolises the challenges presented by the management of elephants in South Africa’s fenced-in game reserves. If left unchecked they breed fast. With fences preventing migration, biodiversity and ecosystems can be negatively affected. This exacerbates human-elephant conflict, especially when competition between bulls and drought stress forces them to quite literally explore greener grass on the other side of the fence.